Preheat oven to 350°F. Rinse chicken tenders in water and place on a clean plate. In a pie pan or other shallow dish, whisk together the egg and buttermilk. In another pie pan or shallow dish, stir together the crushed chips, flour, and salt and pepper as desired. Dip chicken into buttermilk mixture, then into the chip mixture. Press firmly to ensure lots of chips adhere to the outside of the chicken. Transfer coated chicken to a baking sheet lined with parchment paper. Bake in a preheated oven for 10-15 minutes, or just until the chicken tenders are cooked through. Remove and serve with ranch for dipping! Nix that chip on your shoulder, and get some chips on your chicken, instead. This crunchy party snack is one recipe everyone will hurrah over! Everyone loves fried chicken, but who wants all those greasy calories. Not to mention the guilt that hits four seconds after your last bite. Good holy hannah, you think to yourself. I just ate food that flew straight into my arteries. Boo. Hiss. We can't get on board with this. Of course, we can't get on board with NOT indulging in some of our fave eats. Especially when it comes to party time. 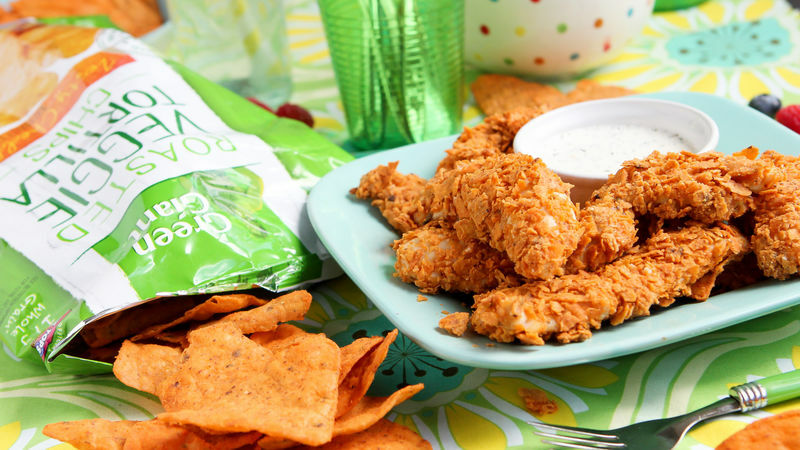 So, we conjured ourselves (all in the name of science, of course) this gorgeous little recipe for Veggie Cheddar Chip Chicken Tenders, topped with the nicest lil' veggie-chip crust you ever did see. Hello, awesome recipe. Let's party. So, the best part of this recipe is how easy it is! Look at that ingredient lineup. Easy, easy, easy, baby. Toss together this recipe in a snap with a dip, coat, and smash. It seriously takes, like seven seconds per chicken strip. Once your chicken strips are coated, bake them just until they're cooked through. Keeping them from overbaking will keep your final strips tenderlicious. Serve them with a bowl of ranch dressing for dipping, and you snuck a little more veggie into your life, along with a whole lotta flavor!